Manila (; Filipino: Maynilà, [majˈnilaʔ] or [majniˈla]), officially the City of Manila (Filipino: Lungsod ng Maynilà [luŋˈsod nɐŋ majˈnilaʔ]), is the capital of the Philippines and the most densely populated city proper in the world. It was the first chartered City by virtue of the Philippine Commission Act 183 on July 31, 1901 and gained autonomy with the passage of Republic Act No. 409 or the "Revised Charter of the City of Manila" on June 18, 1949. Spanish Manila was founded on June 24, 1571, by Spanish conquistador Miguel López de Legazpi, it is one of the oldest cities in the Philippines and was the seat of power for most of the country's colonial rulers. 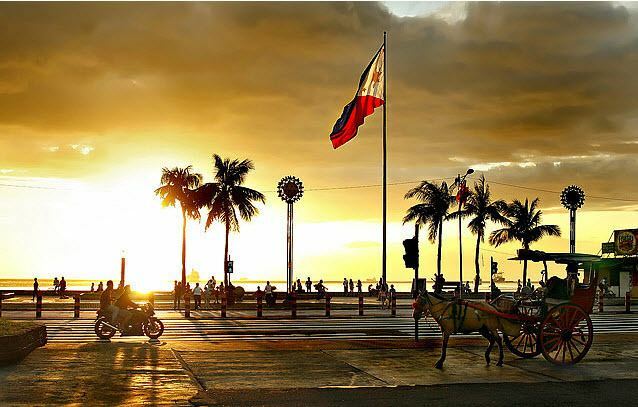 It is situated on the eastern shore of Manila Bay and is home to many landmarks, some of which date back to the 16th century. In 2016, the Globalization and World Cities Research Network listed Manila as an alpha- global city. The city proper is home to 1,780,148 people in 2015, and is the historic core of a built-up area that extends well beyond its administrative limits. The term "Manila" is commonly used to refer to the whole metropolitan area, the greater metropolitan area or the city proper. The officially-defined metropolitan area called Metro Manila, the capital region of the Philippines, includes the much larger Quezon City and the Makati Central Business District. It is the most populous region of the country, one of the most populous urban areas in the world, and is one of the wealthiest regions in Southeast Asia. With 41,515 people per square kilometer, Manila is also the most densely populated city proper in the world. Manila is located on the eastern shores of the Manila Bay in one of the finest harbors in the country. The Pasig River flows through the middle of the city, dividing it into the north and south. Manila is made up of 16 districts: Binondo, Ermita, Intramuros, Malate, Paco, Pandacan, Port Area, Quiapo, Sampaloc, San Andres, San Miguel, San Nicolas, Santa Ana, Santa Cruz, Santa Mesa and Tondo. Manila is also made up of Six Congressional Districts that represents the city on the Lower House of the Philippine Congress. The earliest evidence of human life around present-day Manila is the nearby Angono Petroglyphs, dated to around 3000 BC. Negritos, an Australoid people who became the aboriginal inhabitants of the Philippines, lived across the island of Luzon, where Manila is located, before the Malayo-Polynesians migrated in and assimilated them. The Kingdom of Tondo flourished during the latter half of the Ming dynasty as a result of direct trade relations with China. The Tondo district was the traditional capital of the empire, and its rulers were sovereign kings, not mere chieftains. They were addressed variously as panginuan in Maranao or panginoón in Tagalog ("lords"); anák banwa ("son of heaven"); or lakandula ("lord of the palace"). The Emperor of China considered the Lakans—the rulers of ancient Manila—"王", or kings. 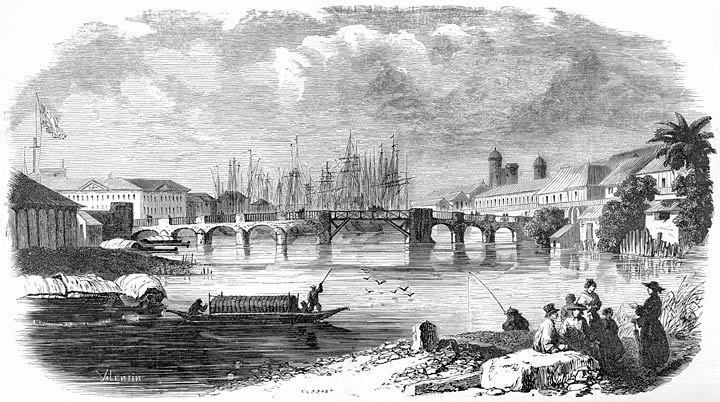 In the 13th century, Manila consisted of a fortified settlement and trading quarter on the shore of the Pasig River. It was then settled by the Indianized empire of Majapahit, as recorded in the epic eulogy poem "Nagarakretagama", which described the area's conquest by Maharaja Hayam Wuruk. Selurong (षेलुरोन्ग्), a historical name for Manila, is listed in Canto 14 alongside Sulot, which is now Sulu, and Kalka. During the reign of Sultan Bolkiah from 1485 to 1521, the Sultanate of Brunei invaded, wanting to take advantage of Tondo's trade with China by attacking its environs and establishing the Muslim Rajahnate of Maynilà (كوتا سلودوڠ; Kota Seludong). The rajahnate was ruled under and gave yearly tribute to the Sultanate of Brunei as a satellite state. It established a new dynasty under the local leader, who accepted Islam and became Rajah Salalila or Sulaiman I. He established a trading challenge to the already rich House of Lakan Dula in Tondo. Islam was further strengthened by the arrival of Muslim traders from the Middle East and Southeast Asia. In 1574, Manila was temporarily besieged by the Chinese pirate Lim Hong, who was ultimately thwarted by the local inhabitants. The city then became the seat of the Spanish colonial government. On June 24, 1571, the conquistador Miguel López de Legazpi arrived in Manila and declared it a territory of New Spain, establishing a city council in what is now the district of Intramuros. López de Legazpi had the local royalty executed or exiled after the failure of the Tondo Conspiracy, a plot wherein an alliance between datus, rajahs, Japanese merchants and the Sultanate of Brunei would band together to execute the Spaniards, along with their Latin American recruits and Visayan allies. The victorious Spaniards made Manila, the capital of the Spanish East Indies and of the Philippines, which their empire would control for the next three centuries. Manila became famous during the Manila–Acapulco galleon trade, which lasted for three centuries and brought goods from Europe, Africa and Hispanic America across the Pacific Islands to Southeast Asia (which was already an entrepôt for goods coming from India, Indonesia and China), and vice versa. Silver that was mined in Mexico and Peru was exchanged for Chinese silk, Indian gems and the spices of Southeast Asia. Likewise, wines and olives grown in Europe and North Africa were shipped via Mexico to Manila. The city was captured by Great Britain in 1762 as part of the European Seven Years' War between Spain, France and Great Britain. The city was then occpuied by the British for almost two years from 1762 to 1764 and remained the capital of the Philippines. Eventually, the British withdrew in accordance with the 1763 Treaty of Paris. An unknown number of Indian soldiers known as sepoys, who came with the British, deserted and settled in nearby Cainta, Rizal, which explains the uniquely Indian features of generations of Cainta residents. The Chinese were then punished for supporting the British invasion, and the fortress city of Intramuros, initially populated by 1200 Spanish families and garrisoned by 400 Spanish troops, kept its cannons pointed at Binondo, the world's oldest Chinatown. The Mexican population was concentrated at the south part of Manila, and also at Cavite, where ships from Spain's American colonies docked, and at Ermita, an area so named because of a Mexican hermit that lived there. After Mexico gained independence in 1821, Spain began to govern Manila directly. Under direct Spanish rule, banking, industry and education flourished more than they had in the previous two centuries. The opening of the Suez Canal in 1869 facilitated direct trade and communications with Spain. The city's growing wealth and education attracted indigenous people, Chinese, Indians, Latinos, and Europeans from the surrounding provinces and facilitated the rise of an ilustrado class that espoused liberal ideas: the ideological foundations of the Philippine Revolution, which sought independence from Spain. 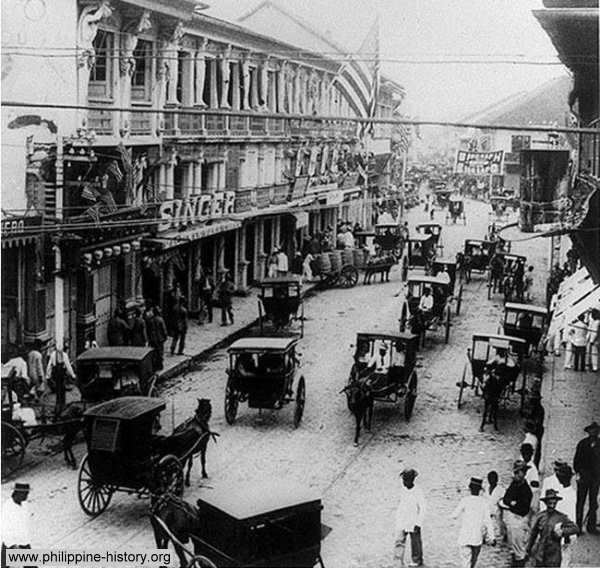 Upon drafting a new charter for Manila in June 1901, the Americans made official what had long been tacit: that the city of Manila consisted not of Intramuros alone but also of the surrounding areas. The new charter proclaimed that Manila was composed of eleven municipal districts: presumably Binondo, Ermita, Intramuros, Malate, Paco, Pandacan, Sampaloc, San Miguel, Santa Ana, Santa Cruz and Tondo. In addition, the Catholic Church recognized five parishes—Gagalangin, Trozo, Balic-Balic, Santa Mesa and Singalong—as part of Manila. Later, two more would be added: Balut and San Andres. Under American control, a new, civilian-oriented Insular Government headed by Governor-General William Howard Taft invited city planner Daniel Burnham to adapt Manila to modern needs. The Burnham Plan included the development of a road system, the use of waterways for transportation, and the beautification of Manila with waterfront improvements and construction of parks, parkways and buildings. The planned buildings included a government center occupying all of Wallace Field, which extends from Rizal Park to the present Taft Avenue. The Philippine Capitol was to rise at the Taft Avenue end of the field, facing toward the sea. Along with buildings for various government bureaus and departments, it would form a quadrangle with a lagoon in the center and a monument to José Rizal at the other end of the field. Of Burnham's proposed government center, only three units—the Legislative Building and the buildings of the Finance and Agricultural Departments—were completed when World War II erupted. During the administration of Ferdinand Marcos, the region of Metro Manila was created as an integrated unit with the enactment of Presidential Decree No. 824 on November 7, 1975. The area encompassed four cities and thirteen adjoining towns, as a separate regional unit of government. On the 405th anniversary of the city's foundation on June 24, 1976, Manila was reinstated by Marcos as the capital of the Philippines for its historical significance as the seat of government since the Spanish Period. Presidential Decree No. 940 states that Manila has always been to the Filipino people and in the eyes of the world, the premier city of the Philippines being the center of trade, commerce, education and culture. Lim was sued by councilor Dennis Alcoreza on 2008 over human rights, charged with graft over the rehabilitation of public schools, and was heavily criticized for his haphazard resolution of the Rizal Park hostage taking incident, one of the deadliest hostage crisis in the Philippines. Later on, Vice Mayor Isko Moreno and 28 city councilors filed another case against Lim in 2012, stating that Lim's statement in a meeting were "life-threatening" to them. In the 2013 elections, former President Joseph Estrada defeated Lim in the mayoral race. During his term, Estrada has paid more than ₱5 billion in city debts and increased the city's revenues from ₱6.2 billion in 2012 to ₱14.6 billion by 2016, resulting in increased infrastructure spending and the betterment of the welfare of the people of Manila. In 2015, the city became the most competitive city in the Philippines, making the city the best place for doing business and for living in. However, despite these achievements, Estrada only narrowly won over Lim in their electoral rematch in 2016. In 2012, DMCI Homes began constructing Torre de Manila, which became controversial for ruining the sight line of Rizal Park. It is infamously known as the "national photobomber" or as "Terror de Manila". The Torre de Manila controversy is regarded as one of the most sensationalized heritage issues of the country. Manila is situated on the eastern shore of Manila Bay, on the western edge of Luzon, 800 miles (1,300 kilometers) from mainland Asia. One of Manila's greatest natural resources is the protected harbor upon which it sits, regarded as the finest in all of Asia. The Pasig River flows through the middle of city, dividing it into the north and south. The overall grade of the city's central, built-up areas, is relatively consistent with the natural flatness of its overall natural geography, generally exhibiting only slight differentiation otherwise. Almost all of Manila sits on top of centuries of prehistoric alluvial deposits built by the waters of the Pasig River and on some land reclaimed from Manila Bay. Manila's land has been altered substantially by human intervention, with considerable land reclamation along the waterfronts since the American colonial times. Some of the city's natural variations in topography have been evened out. As of 2013, Manila had a total area of 42.88 square kilometres (16.56 sq mi). In 2017, the City Government approved four reclamation projects: the New Manila Bay International Community (407.43 hectares), Solar City (148 hectares), the Manila Harbour Center expansion (50 hectares) and Horizon Manila (419 hectares). Projects such as these have been criticized by environmentalists and the Catholic Church, stating that these reclamation projects are not sustainable and would put communities at risk of flooding. A fifth reclamation project is possible and when built, it will contain the in-city housing relocation projects. Swiss Re, the world’s second-largest reinsurer based in Zürich, Switzerland, places Manila as the second riskiest capital city to live in. The company cited dangers of earthquakes and flooding. The seismically active Marikina Valley Fault System poses a threat to Manila and the surrounding regions. Manila has endured several deadly earthquakes, notably in 1645 and in 1677 which destroyed the stone and brick medieval city. The Earthquake Baroque style was used by architects during the Spanish colonial period in order to adapt to the frequent earthquakes. Under the Köppen climate classification system, Manila has a tropical savanna climate (Köppen climate classification Aw). Together with the rest of the Philippines, Manila lies entirely within the tropics. Its proximity to the equator means that the temperature range is very small, rarely going below 20 °C (68 °F) or above 38 °C (100 °F). Temperature extremes have ranged from 14.5 °C (58.1 °F) on January 11, 1914, to 38.6 °C (101.5 °F) on May 7, 1915. Humidity levels are usually very high all year round. Manila has a distinct dry season from December through May, and a relatively lengthy wet season that covers the remaining period with slightly cooler temperatures. In the wet season, it rarely rains all day, but rainfall is very heavy during short periods. Typhoons usually occur from June to September. Due to industrial waste and automobiles, Manila suffers from air pollution, affecting 98% of the population. Annually, the air pollution causes more than 4,000 deaths. Ermita is Manila's most air polluted district due to open dump sites and industrial waste. According to a report in 2003, the Pasig River is one of the most polluted rivers in the world with 150 tons of domestic waste and 75 tons of industrial waste dumped daily. Annually, Manila is hit with 5 to 7 typhoons creating floods. In 2009, Typhoon Ketsana struck the Philippines. In its aftermath, the lack of infrastructure led to one of the worst floodings in the Philippines and creating a significant amount of pollution. Following the aftermath of Typhoon Ketsana, the city began to dredge its rivers and improve its drainage network. The Pasig River Rehabilitation Commission is in charge of cleaning up the Pasig River and tributaries for transportation, recreation and tourism purposes. Rehabilitation efforts have resulted in the creation of parks along the riverside, along with stricter pollution controls. The city is made up of fourteen city districts, according to Republic Act No. 409—the Revised Charter of the City of Manila—the basis of which officially sets the present-day boundary of the city. Two were later added, which are Santa Mesa (partitioned off from Sampaloc) and San Andres (partitioned off from Santa Ana). Manila is also famed for its Art Deco theaters. Some of these were designed by National Artists for Architecture such as Juan Nakpil and Pablo Antonio. Unfortunately most of these theater neglected, and some of it have been demolished. The historic Escolta Street in Binondo features many buildings of Neoclassical and Beaux-Arts architectural style, many of which were designed by prominent Filipino architects during the American Rule in the 1920s to the late 1930s. Many architects, artists, historians and heritage advocacy groups are pushing for the revival of Escolta Street, which was once the premier street of the Philippines. Almost all of Manila's prewar and Spanish colonial architecture were destroyed during its battle for liberation by the intensive bombardment of the United States Air Force during World War II. Reconstruction took place afterwards, replacing the destroyed historic Spanish-era buildings with modern ones, erasing much of the city's character. Some buildings destroyed by the war have been reconstructed, such as the Old Legislative Building (now the National Museum of Fine Arts), Ayuntamiento de Manila (now the Bureau of the Treasury) and the currently under construction San Ignacio Church and Convent (as the Museo de Intramuros). There are plans to rehabilitate and/or restore several neglected historic buildings and places such as Plaza Del Carmen, San Sebastian Church and the Manila Metropolitan Theater. Spanish-era shops and houses in the districts of Binondo, Quiapo, and San Nicolas are also planned to be restored, as a part of a movement to restore the city to its former glory and its beautiful prewar state. According to the 2015 census, the population of the city was 1,780,148, making it the second most populous city in the Philippines. Manila is the most densely populated city in the world, with 43,079 inhabitants per km2. District 6 is listed as being the most dense with 68,266 inhabitants per km2, followed by District 1 with 64,936 and District 2 with 64,710, respectively. District 5 is the least densely populated area with 19,235. In the 2016 electoral roll, it had 974,479 registered voters. Manila's population density dwarfs that of Kolkata (27,774 inhabitants per km2), Mumbai (22,937 inhabitants per km2), Paris (20,164 inhabitants per km2), Dhaka (19,447 inhabitants per km2), Shanghai (16,364 inhabitants per km2, with its most dense district, Nanshi, having a density of 56,785 inhabitants per km2), and Tokyo (10,087 inhabitants per km2). Manila has been presumed to be the Philippines' largest city since the establishment of a permanent Spanish settlement with the city eventually becoming the political, commercial and ecclesiastical capital of the country. Its population increased dramatically since the 1903 census as the population tended to move from rural areas to towns and cities. In the 1960 census, Manila became the first Philippine city to breach the one million mark (more than 5 times of its 1903 population). The city continued to grow until the population somehow "stabilized" at 1.6 million and experienced alternating increase and decrease starting the 1990 census year. This phenomenon may be attributed to the higher growth experience by suburbs and the already very high population density of city. As such, Manila exhibited a decreasing percentage share to the metropolitan population from as high as 63% in the 1950s to 27.5% in 1980 and then to 13.8% in 2015. The much larger Quezon City marginally surpassed the population of Manila in 1990 and by the 2015 census already has 1.1 million people more. Nationally, the population of Manila is expected to be overtaken by cities with larger territories such as Caloocan City and Davao City by 2020. Manila is a major center for commerce, banking and finance, retailing, transportation, tourism, real estate, new media as well as traditional media, advertising, legal services, accounting, insurance, theater, fashion, and the arts in the Philippines. Around 60,000 establishments operates in the city. The Port of Manila is the largest seaport in the Philippines, making it the premier international shipping gateway to the country. The Philippine Ports Authority is the government agency responsible to oversee the operation and management of the ports. The International Container Terminal Services Inc. cited by the Asian Development Bank as one of the top five major maritime terminal operators in the world has its headquarters and main operations on the ports of Manila. Another port operator, the Asian Terminal Incorporated, has its corporate office and main operations in the Manila South Harbor and its container depository located in Santa Mesa. Divisoria in Tondo is known as the "shopping mecca of the Philippines". Numerous shopping malls are located in this place, which sells products and goods at bargain price. Small vendors occupy several roads that causes pedestrian and vehicular traffic. A famous landmark in Divisoria is the Tutuban Center, a large shopping mall that is a part of the Philippine National Railways' Main Station. It attracts 1 million people every month, but is expected to add another 400,000 people when the LRT Line 2 West Extension is constructed, which is set to make it as Manila's busiest transfer station. Diverse manufacturers within the city produce industrial-related products such as chemicals, textiles, clothing, and electronic goods. Food and beverages and tobacco products also produced. Local entrepreneurs continue to process primary commodities for export, including rope, plywood, refined sugar, copra, and coconut oil. The food-processing industry is one of the most stable major manufacturing sector in the city. The Pandacan Oil Depot houses the storage facilities and distribution terminals of the three major players in the country's petroleum industry, namely Caltex Philippines, Pilipinas Shell and Petron Corporation. The oil depot has been a subject of various concerns, including its environmental and health impact to the residents of Manila. The Supreme Court has ordered that the oil depot to be relocated outside the city by July 2015, but it failed to meet this deadline. It is currently being demolished which is expected to be finished before the year 2016 ends, and plans have been set up to turn this 33 hectare facility into a transport hub or even a food park. Manila serves as the headquarters of the Central Bank of the Philippines which is located along Roxas Boulevard. Some universal banks in the Philippines that has its headquarters in the city are the Landbank of the Philippines and Philippine Trust Company. Philam Life Insurance Company, currently the largest life insurance company in the Philippines in terms of assets, net worth, investment and paid-up capital, has its headquarters along United Nations Avenue in Ermita. Unilever Philippines has its corporate office along United Nations Avenue in Paco. Toyota, a company listed in the Forbes Global 2000, also has its regional office along UN Avenue. Manila welcomes over 1 million tourists each year. Major destinations include the historic Walled City of Intramuros, the Cultural Center of the Philippines Complex, Manila Ocean Park, Binondo (Chinatown), Ermita, Malate, Manila Zoo, the National Museum Complex and Rizal Park. The Walled City of Intramuros and Rizal Park were designated as flagship destination and as a tourism enterprise zone in the Tourism Act of 2009. Rizal Park, also known as Luneta Park, is the national park and the largest urban park in Asia with an area of 58 hectares (140 acres), The park was constructed as an honor and dedication to the country's national hero José Rizal, who was executed by the Spaniards on charges of subversion. The flagpole west of the Rizal Monument is the Kilometer Zero marker for distances to the rest of the country. The park was managed by the National Parks and Development Committee. The 0.67 square kilometers (0.26 sq mi) Walled City of Intramuros is the historic center of Manila. It is administered by the Intramuros Administration, an attached agency of the Department of Tourism. It contains the famed Manila Cathedral and the 18th Century San Agustin Church, a UNESCO World Heritage Site. Kalesa is a popular mode of transportation for tourists in Intramuros and nearby places including Binondo, Ermita and Rizal Park. Manila is designated as the country's pioneer of medical tourism, expecting it to generate $1 billion in revenue annually. However, lack of progressive health system, inadequate infrastructure and the unstable political environment are seen as hindrances for its growth. Manila is regarded as one of the best shopping destinations in Asia. Major shopping malls, department stores, markets, supermarkets and bazaars thrives within the city. Quiapo is referred to as the "Old Downtown", where tiangges, markets, boutique shops, music and electronics stores are common. C.M. Recto Avenue is where lots of department stores are located. One of Recto Avenue's famous destinations is Divisoria, home to numerous shopping malls in the city, including the famed Tutuban Center and the Lucky Chinatown Mall. It is also dubbed as the shopping mecca of the Philippines where everything is sold at bargain price. Binondo, the oldest Chinatown in the world, is the city's center of commerce and trade for all types of businesses run by Filipino-Chinese merchants with a wide variety of Chinese and Filipino shops and restaurants. As a result of Spanish cultural influence, Manila is a predominantly Christian city. As of 2010, Roman Catholics were 83.5% of the population, followed by adherents of the Philippine Independent Church (2.4%); Iglesia ni Cristo (1.9%); various Protestant churches (1.8%); and Buddhists (1.1%). Members of Islam and other religions make up the remaining 10.4% of the city's population. Manila is the site of prominent Catholic churches and institutions. There are 113 Catholic churches within the city limits; 63 are considered as major shrines, basilicas, or a cathedral. The Manila Cathedral is the seat of the Roman Catholic Archdiocese of Manila and the oldest established church in the country. Aside from the Manila Cathedral, there are also three other basilicas in the city: Quiapo Church, Binondo Church, and the Minor Basilica of San Sebastián. The San Agustín Church in Intramuros is a UNESCO World Heritage Site and is one of the two fully air-conditioned Catholic churches in the city. Manila also has other parishes located throughout the city, with some of them dating back to the Spanish Colonial Period when the city serves as the base for numerous Catholic missions both within the Philippines and to Asia beyond. The indigenous Iglesia ni Cristo has several locales (akin to parishes) in the city, including its very first chapel (now a museum) in Punta, Sta. Ana. Evangelical, Pentecostal and Seventh-day Adventist denominations also thrive within the city. The headquarters of the Philippine Bible Society is in Manila. Also, the main campus of the Cathedral of Praise is located along Taft Avenue. Jesus Is Lord Church also has several branches and campuses in Manila, and celebrates its anniversary yearly at the Burnham Green and Quirino Grandstand in Rizal Park. The city also hosts other religions. There are many Buddhist and Taoist temples serving the Chinese Filipino community. Quiapo is home to a sizable Muslim population which worships at Masjid Al-Dahab. Members of the Indian expatriate population have the option of worshiping at the large Hindu temple in the city, or at the Sikh gurdwara along United Nations Avenue. The National Spiritual Assembly of the Bahá'ís of the Philippines, the governing body of the Filipino Bahá'í community, is headquartered near Manila's eastern border with Makati. Manila celebrates civic and national holidays. Since most of the city's citizens are Roman Catholics, most of the festivities are religious in nature. Manila Day, which celebrates the city's founding on June 24, 1571, was first proclaimed by Herminio A. Astorga (then Vice Mayor of Manila) on June 24, 1962 and has been annually commemorated, under the patronage of John the Baptist. Each of the city's barangays also have their own festivities guided by their own patron saint. The city is also the host to the Feast of the Black Nazarene, held every January 9, which draws millions of Catholic devotees. Other religious feasts held in Manila are the Feast of Santo Niño in Tondo and Pandacan held on the third Sunday of January and the Feast of the Nuestra Señora de los Desamparados de Manila (Our Lady of the Abandoned), the patron saint of Santa Ana and held every May 12. Non-religious holidays include the New Year's Day, National Heroes' Day, Bonifacio Day and Rizal Day. As the cultural center of the Philippines, Manila is the home to a number of museums. The National Museum Complex of the National Museum of the Philippines is located in Rizal Park. It is composed of the National Museum of Fine Arts, the National Museum of Anthropology and the National Museum of Natural History. Museums established or run by educational institutions include the Mabini Shrine, the DLS-CSB Museum of Contemporary Art and Design, UST Museum of Arts and Sciences, and the UP Museum of a History of Ideas. Bahay Tsinoy, one of Manila's most prominent museums, documents the Chinese lives and contributions in the history of the Philippines. The Intramuros Light and Sound Museum chronicles the Filipinos desire for freedom during the revolution under Rizal's leadership and other revolutionary leaders. The Metropolitan Museum of Manila exhibits the Filipino arts and culture. Other museums in the city are the Museum of Manila, the city-owned museum that exhibits the city's culture and history, Museo Pambata, a children's museum, the Museum of Philippine Political History, which exhibits notable political events in the country, the Parish of the Our Lady of the Abandoned and the San Agustin Church Museum, which houses religious artifacts, and Plaza San Luis, a public museum. Manila—officially known as the City of Manila—is the national capital of the Philippines and is classified as a Special City (according to its income) and a Highly Urbanized City (HUC). The mayor is the chief executive, and is assisted by the vice mayor, the 36-member City Council, six Congressmen, the President of the Association of Barangay Captains, and the President of the Sangguniang Kabataan. The members of the City Council are elected as representatives of specific congressional districts within the city. The city, however, have no control over Intramuros and the Manila North Harbor. The historic Walled City is administered by the Intramuros Administration, while the Manila North Harbor is managed by the Philippine Ports Authority. Both are national government agencies. The barangays that have jurisdictions over these places only oversee the welfare of the city's constituents and cannot exercise their executive powers. In the 2015 Annual Audit Report by the Commission on Audit on the City of Manila, the city's total income was ₱12,589,845,794. The city increased its revenue collection by 20.80% or 1.94 billion pesos higher than that of 2014. The city's asset was worth ₱18.6 billion in 2013. Its local income was ₱5.41 billion and its national government allocation was ₱1.74 billion, having an annual regular income (ARI) of ₱7.15 billion. Manila's net income was ₱3.54 billion in 2014. The City of Manila has the highest budget allocation to healthcare among all the cities and municipalities in the Philippines. It was also one of the cities with the highest tax and internal revenue. Tax revenue accounts for 46% of the city's income in 2012. Manila employs 14,586 personnel by the end of 2015. Manila is made up of 896 barangays, which are grouped into 100 Zones for statistical convenience. Manila has the most number of barangays in the Philippines. Attempts at reducing its number have not prospered despite local legislation—Ordinance 7907, passed on 23 April 1996—reducing the number from 897 to 150 by merging existing barangays, because of the failure to hold a plebiscite. District III (2015 population: 197,242) covers Binondo, Quiapo, San Nicolas and Santa Cruz. District V (2015 population: 366,714) covers Ermita, Malate, Paco Port Area, Intramuros, San Andres Bukid, and a portion of Santa Ana. The historic Walled City is located here, along with Manila Cathedral and San Agustin Church, a UNESCO World Heritage Site. On a for-hire basis, the city is served by numerous taxicabs, "tricycles" (motorcycles with sidecars, the Philippine version of the auto rickshaw), and "trisikads" or "sikads", which are also known as "kuligligs" (bicycles with a sidecars, the Philippine version of pedicabs). In some areas, especially in Divisoria, motorized pedicabs are popular. Spanish-era horse-drawn calesas are still a popular tourist attraction and mode of transportation in the streets of Binondo and Intramuros. By October 2016, the city will phase out all gasoline-run tricycles and pedicabs and replace them with electric tricycles (e-trikes). The city plans to distribute 10,000 e-trikes to qualified tricycle drivers from the city. The main terminal of the Philippine National Railways lies within the city. One commuter railway within Metro Manila is in operation. The line runs in a general north-south direction from Tutuban (Tondo) toward Laguna. The Port of Manila, located in the vicinity of Manila Bay, is the chief seaport of the Philippines. The Pasig River Ferry Service which runs on the Pasig River is another form of transportation. The city is also served by the Ninoy Aquino International Airport and Clark International Airport. In 2006, Forbes magazine ranked Manila the world's most congested city. According to Waze's 2015 "Global Driver Satisfaction Index", Manila is the town with the worst traffic worldwide. Manila is notorious for its frequent traffic jams and high densities. The government has undertaken several projects to alleviate the traffic in the city. Some of the projects include: the proposed construction of a new viaduct or underpass at the intersection of España Boulevard and Lacson Avenue, the construction of the Metro Manila Skyway Stage 3, the proposed LRT Line 2 West Extension Project from Recto Avenue to Tondo or the Port Area, and the expansion and widening of several national and local roads. However, such projects have yet to make any meaningful impact, and the traffic jams and congestion continue unabated. The Metro Manila Dream Plan, formulated in the mid-2010s seeks to address these problems. It consists of a list of short term priority projects and medium to long term infrastructure projects that will last up to 2030. The Manila Health Department is responsible for the planning and implementation of the health care programs provided by the city government. It operates 59 health centers and six city-run hospitals, which are free of charge for the city's constituents. The six public city-run hospitals are the Ospital ng Maynila Medical Center, Ospital ng Sampaloc, Gat Andres Bonifacio Memorial Medical Center, Ospital ng Tondo, Sta. Ana Hospital, and Justice Jose Abad Santos General Hospital. Manila is also the site of the Philippine General Hospital, the tertiary state-owned hospital administered and operated by the University of the Philippines Manila. The city is also planning to put up an education, research and hospital facility for cleft-palate patients. The city has free immunization programs for children, specifically targeted against the seven major diseases – smallpox, diphtheria, tetanus, yellow fever, whooping cough, polio, and measles. As of 2016, a total of 31,115 children age one and below has been “fully immunized”. The Manila Dialysis Center that provides free services for the poor has been cited by the United Nations Committee on Innovation, Competitiveness and Public-Private Partnerships as a model for public-private partnership (PPP) projects. The center of education since the colonial period, Manila — particularly Intramuros — is home to several Philippine universities and colleges as well as its oldest ones. It served as the home of the University of Santo Tomas (1611), Colegio de San Juan de Letran (1620), Ateneo de Manila University (1859), Lyceum of the Philippines University and the Mapua Institute of Technology. Only Colegio de San Juan de Letran (1620) remains at Intramuros; the University of Santo Tomas transferred to a new campus at Sampaloc in 1927, and Ateneo left Intramuros for Loyola Heights, Quezon City (while still retaining "de Manila" in its name) in 1952. The University of the City of Manila (Pamantasan ng Lungsod ng Maynila) located at Intramuros, and Universidad de Manila located just outside the walled city, are both owned and operated by the Manila city government. The national government controls the University of the Philippines Manila, the oldest of the University of the Philippines constituent universities and the center of health sciences education in the country. The city is also the site of the main campus of the Polytechnic University of the Philippines, the largest university in the country in terms of student population. The University Belt refers to the area where there is a high concentration or a cluster of colleges and universities in the city and it is commonly understood as the one where the San Miguel, Quiapo and Sampaloc districts meet. Generally, it includes the western end of España Boulevard, Nicanor Reyes St. (formerly Morayta St.), the eastern end of Claro M. Recto Avenue (formerly Azcarraga), Legarda Avenue, Mendiola Street, and the different side streets. Each of the colleges and universities found here are at a short walking distance of each other. Another cluster of colleges lies along the southern bank of the Pasig River, mostly at the Intramuros and Ermita districts, and still a smaller cluster is found at the southernmost part of Malate near the border with Pasay such as the private co-educational institution of De La Salle University, the largest of all De La Salle University System of schools. The Division of the City Schools of Manila, a branch of the Department of Education, refers to the city's three-tier public education system. It governs the 71 public elementary schools, 32 public high schools. The city also contains the Manila Science High School, the pilot science high school of the Philippines; the National Museum, where the Spoliarium of Juan Luna is housed; the Metropolitan Museum of Manila, a museum of modern and contemporary visual arts; the Museo Pambata, the Children's Museum, a place of hands-on discovery and fun learning; and, the National Library, the repository of the country's printed and recorded cultural heritage and other literary and information resources.